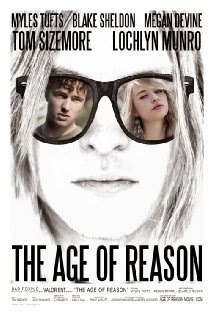 I love it when films like The Age of Reason pop on to my radar. I love it because its a good movie. I always love to see good movies. I also love it because the film was sent my way by co-director/ co-writer Andrew Schrader. I love it when a filmmaker contacts me because to me it means that they care enough for their film that they're willing to fight for it like they'd fight for their children. If a film maker feels that deeply about their work then I'll take a look. Don't groan, no, don't groan. Just don't do it, it's the wrong thing to do. I know,I kind of groaned when I read the synopsis myself, but I was wrong. I know it sounds like your typical inde-coming of age film or worse a juvenile comedy but there's more going on, Its more complex and more compelling than that sounds. Trust me this is one of those films that isn't easily summed up simply because there is too many characters and plot points. This isn't self absorbed navel gazing or stupid teenager tricks this is a real nice slice of life. I knew that I was in for something special with the opening credits. The film opens with this really cool sequence of Freddy and Oz smashing cars. The boys are bitching to each other and breaking things. In a weird way its a sequence that echoes other films-BUT- and as you can see that's a big but -there is something in the way co-directors Jordan Harris and Andrew Schrader put it together that makes you sit up and go "hello". It looks like we've been here for a couple of seconds and then the craft and skill of the directors takes over and you realize that this isn't been there and done that, this is seeing the world and things we've missed with whole new eyes.. I said "hello" a great deal while watching The Age of Reason because it constantly surprised me in the right ways. At this point I have to ask who the hell are Jordan Harris and Andrew Schrader, and where did they come from? I know from reading their IMDB write ups they worked behind the scenes on a bunch of different low budget films and they made a horror film, Fever Night aka Band of Satanic Outsiders, But there wasn't anything that made me think that they would turn in a real treasure of film about two kids being forced to face adulthood. How did they do this? What makes the film so special isn't so much the story unto itself rather it's how the directors color everything and create people instead of characters. The people on screen have added dimensions. They aren't so much characters rather they are people we know. As with much about this film I can't explain it but watching the film I had the sense that Freddy and Oz kind of walked off the screen and pulled me into their world or was it they got pulled into mine. I think it's the latter since in a weird way they kind of seem more like friends then people in a movie.Watching the film I had a sense that I knew them as well as I knew many of my real friends. The performances are so good that even when you watch the characters stand and do nothing or walk they have the presence that they are somebody real and not an actor. No this is not the dementia of a guy who's seen way too many movies in the last couple years, more its more a testament to how wonderfully crafted the characters are. Of course none of it would have worked if the cast weren't dead on, and they are. I don't think anyone in the cast is bad, or if they are I didn't notice.I know I should go down and list every one individually but I need to mention Tom Sizemore who plays Oz's dad. There is something about his performance that is deeply moving. There is this small moment in the film where he is taking his medicine with alcohol and his son asks if it's safe. The pill he says is for his heart but the drink is for his soul. There is something heartbreaking in that moment. There is a crushing edge to the vocal inflection that lets you know that he is a man destroyed by life. Its a small throw away moment but it says volumes. It's a affecting in part because we know of Sizemore's notorious past but also because it's clear Sizemore isn't hiding his soul so it has all the weight of a man in pain behind it. This is one of those movies that makes me fall in love with film again. I mean we have shattered expectations, great characters, a good amount of laughs, some tugs on the heart strings and directors with skill and style to burn. This is one of those films that I'm torn between really writing up or just gushing over. If I really write the film up I run the risk of spoiling it for you, but if I gush I run the risk of over selling it. Perhaps what I've done. And perhaps I should just leave this piece here and tell you that you really need to track this film down. It's currently on the festival circuit. Trust me, this is a keeper. So I saw this movie at the boston international film festival and was completely taken by surprise. Theres usually a lot of crap at festivals, but this was really good. And when i try to describe it to people it's really hard, because there's so much in it. A lot happens. I don't knwo if i've ever seen a movie works like this stylistically, but I was really impressed.